Jesse James Meets Frankenstein’s Daughter. Directed by William Beaudine. Written by Carl K. Hittleman. Release Date: April 10, 1866. It’s Halloween! There isn’t a lot of Civil War horror stuff (unless you count Gods and Generals! Zing! ), but there is this little gem about one of Reconstruction’s most enduring figures, Jesse James. He played a big, sorta weird role in my childhood (more on that in a future post), so I’ve always known about this bizarre movie but never sought it out. Imagine my surprise when I found the whole thing on YouTube. Even more amazing, Jesse James Meets Frankenstein’s Daughter exceeded even my lowest expectations. But even in this campy Ed Wood-esque nightmare, there are still interesting elements of Civil War memory and James’s controversial legacy. Shenandoah. Directed by Andrew W. McLaglen. Written by James Lee Barrett. Release Date: June 3, 1965. 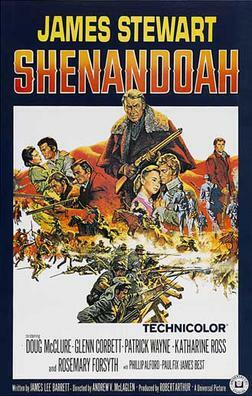 Even Shenandoah, released in 1965 and starring Jimmy Stewart as Charlie Anderson (the head of a family that includes four strapping young men who somehow evade the draft), fails to turn against the Confederacy. By the end of the film, the loss of his children and the destruction of his farm leaves Anderson confused and disillusioned about the futility of all wars. Mostly unfamiliar with the film, I decided to watch it and test my own impressions against Levin’s. What I found was that Shenandoah is more anti-Confederate than Levin thinks it is, but hedges its bets by making war itself the true enemy. The Twilight Zone. “Still Valley,” Season 3, Episode 11. Directed by James Sheldon. Written by Rod Serling and Manly Wade Wellman. Release Date: November 24, 1961. The Beverly Hillbillies, “The South Rises Again,” Season 6, Episode 13. Directed by Joseph Depew. Written by Paul Henning and Buddy Atkinson. Release Date: November 29, 1967.